Sterling Silver, real Turquoise, Coral, Jet, Abalone shell, Brown shell, Pink shell, along with White and Yellow Mother of Pearl. Each link measures approximately 7/8" long and 7/8" wide. Total belt length measures approximately 36-1/2" long and 1-1/4" at it's widest point. The belt weighs 137 grams. This is truly an outstanding concho belt that will make a great impression! 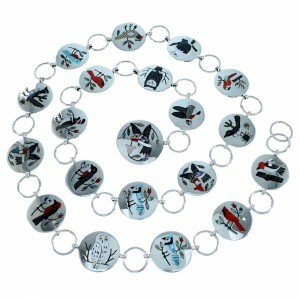 This piece of Native American jewelry is Zuni hand crafted by artist S. C. Edaakie, out of genuine sterling silver, and real multicolor inlay. The inlay consists of: Turquoise, Coral, Jet, Abalone shell, Brown shell, Pink shell, along with White and Yellow Mother of Pearl. 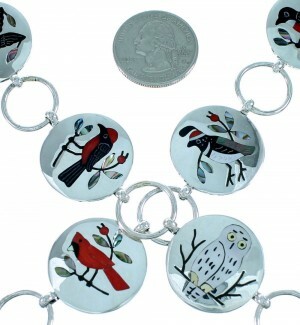 The inlay is carefully set, while creating breathtaking bird designs that include: hummingbird, eagle, cardinal, blue jay, owl, parrot and more! A total of TWENTY inlaid birds make up the belt for an extraordinary finish. In Native American beliefs, the eagle is the master of the sky; he is considered to be a carrier of prayers. Many of the Indian Nations admire the eagle for bravery and special connections to the creator. Hummingbirds are mainly known to be defenders of their territory. Many times stronger than their small size would indicate. This piece is absolutely stunning and is among the finest jewelry we have ever had! 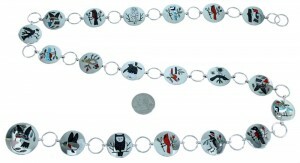 Each belt link is hallmarked by the artist.